When it comes to setting up your nursery and organizing your baby’s closet there are tons of unique ideas and tricks but the real star of the organization is when it comes to organizing all the baby clothes. With so much extra room to use to accommodate tiny baby clothes, use a rod doubler to maximize vertical hanging space. Stacking drawers are another great space saver option and offers flexibility as your child gets bigger, you’ll need to regain that extra vertical space to accommodate for longer clothes. From your baby shower to little outfits you pick up here there’s no doubt that by now, you have a good collection of baby clothes sized through the baby’s first year. While you may be hanging up clothes as you get them, having so many different sizes in one closet can become a challenge. To ensure you don’t misplace larger clothes or have a struggle looking for the right size to dress your little one later on, the key is to keep clothes organized by size/age for quick reference and easy prep time in the mornings. To do this, begin by separating these clothes by size/age and print out our free clothing rod divider downloads to keep things in order. 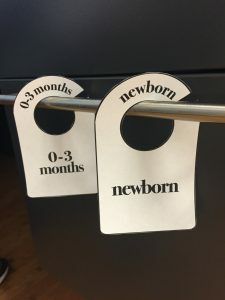 For these clothing dividers, print and cut out the templates on plain paper and decorate as you desire or print these out on colored paper for a simple but nursery-matching look. For a little extra durability print out on cardstock or glue the dividers to thin cardboard and cut out accordingly. Dividing clothes this way not only helps with organization, it can also help to ensure you don’t over-buy in any one size. As your little one outgrows clothes, place a pre-labeled box for each size/age at the bottom of the closet or on a shelf. This makes it easy to place outgrown clothes in the appropriate organized box for quick identification for a future child or for when you decide to get rid of clothes by donating or having a garage sale. 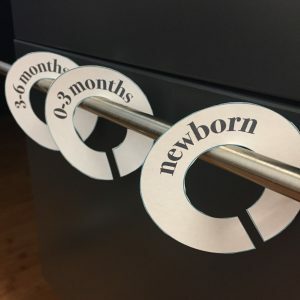 Closet organization may seem like a last thought for your busy schedule but when it comes to a new baby, it may be the little bit of simplification that takes the unnecessary stress out of getting your baby ready each day.